What is the best way to welcome autumn and stay warm this season? With a hot mug of tomato and basil soup of course! 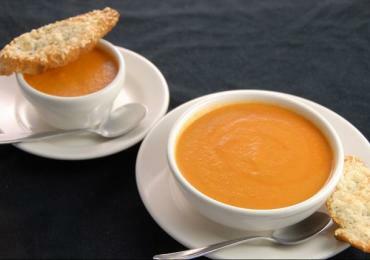 Nordstrom&apos;s signature soup is sure to satisfy with its hearty and delicious flavor. The parmesan and garlic crostini provides a much needed crunch to the dish. Serve it up in mugs for a casual football party or in elegant bowls for a nice family dinner. Let us know how your dish turns out. 1. In a 6- to 8-quart saucepan, over medium heat, warm the oil and swirl to coat the bottom of the pan. 2. Add the carrots, onions and dried basil, and sauté, stirring occasionally, until softened, 10 to 12 minutes. 3. Add the tomatoes, including the purée, and the broth and bring just to a boil. 4. Reduce the heat to low and simmer, uncovered, for 20 minutes to blend the flavors. 5. Remove from the heat. Purée the soup in the saucepan using a wand-type emulsion blender; or working in batches, purée the soup in a blender or in a food processor fitted with the metal blade. 6. Return the puréed soup to the saucepan, add the cream and place over medium heat. Warm until heated through. Season to taste with salt and pepper. 1. Position a rack in the top third of the oven and preheat the oven to 350 F.
2. Mash the butter, cheese, salt and granulated garlic together in a medium bowl with a rubber spatula until combined. Stir in the parsley. 4. Bake, uncovered, until golden brown, 10 to 12 minutes. Serve warm.